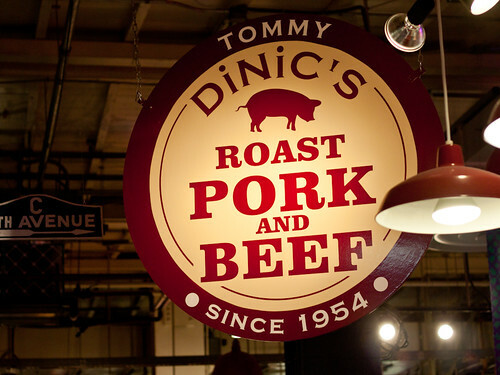 I've been told that Tommy DiNic's is basically the mecca of roast pork sandwiches (at least in Philadelphia). They say that the sandwiches made from their pork and beef selections are magical in flavor, unparalleled in juice content, and make your farts smell like cookies and flowers... simultaneously (I don't even know how that works). As a sucker for pretty much any roast meat (Asian or otherwise), a lover of sandwiches, and a fatass in general, it was inevitable that I eventually sauntered over to Grand Terminal Market to shove one of these bad boys down the hatch. And disappear it did. Like I said, there's a certain elegance in simplicity. Their menu is deceptively short. Six choices of meat, 3 possible toppings, with a discount if you do a combination. I think that yields 48 possible sandwich + topping combinations, so you do have some decisions to make. Luckily, you have plenty of time for this, because the line is legitimately long. Stupid long. It curls around the span of the eating counter and around the back. Since they're supposedly most well known for their roast pork, it seemed obvious that it'd be what was ordered. Trying to keep it traditional, cheese was provolone, topping choice was left as sweet roasted peppers. I don't think photos really justify how beautiful this sandwich is upon unwrapping. The bread gleams with an ever so thin layer of oil from the pork, as juices spill out from the ends of the bread. It truly is a spectacle to behold... that is, if you stare at your food like I do. I've been told it's weird. Holy Batman, look at how thin that roast pork is! The bread was okay, certainly not a detracting factor or anything, but obviously the standout is the pork. Sliced with the precision of a Japanese samurai on LSD, each layer is absurdly thin and uniform. As a result, you end up with more surface area, an extremely tender texture (almost as soft as pulled pork), and juices going everywhere. Entirely satisfied, I can't actually complain about anything here, except for the fact that I was not warned about said juices. My pants will never be the same. Some people might say that DiNic's is more hype than substance, and that's probably true. My farts didn't smell like cookies OR flowers later that night, but it's definitely not just a tourist trap (at least I don't think so). Now... having tried their roast pork, I still feel compelled to get a brisket sandwich. I watched them slice that, and I can only imagine eating a sandwich filled with it. I think I'd probably have to change my pants afterwards... again. i gotta make a trip down to philly, like now! Danny - yeah man... 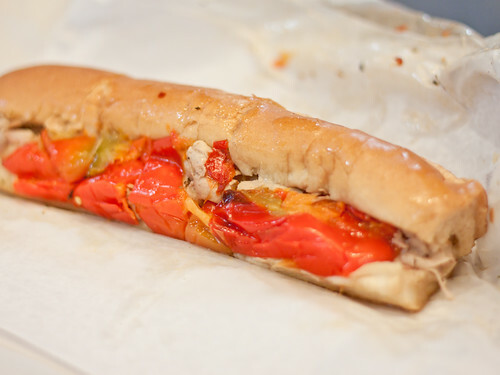 I know NYC has phenomenal everything, but I think Philly has them beat when it comes to things that go in hoagie rolls. Next time, try it with the broccoli rabe instead of the peppers - I think the slight bitterness from the greens makes for a nice contrast with the sharp provolone. 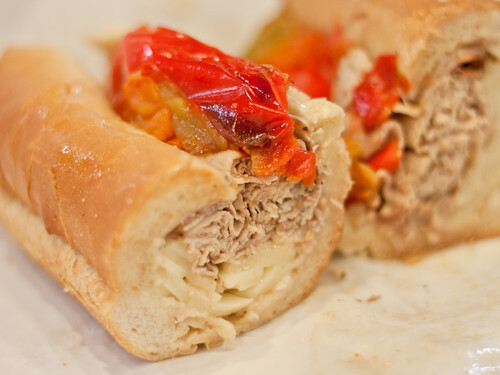 And if you get a chance, try out Tony Luke's roast pork sandwich. Personally, I liked theirs more than DiNic's. Kevin - for sure, thanks for the tip. I was actually gonna go get the broccoli rabe/provolone/cheesesteak one of these weekends. The combination sounds entirely euphoric. munchimonster - I don't know how to navigate Reading Terminal... it's too spread out and not very well organized. oh man, the last time i was in philly i had that too. it is so simple and good. we need something like that here in new york... although i guess porchetta sandwiches are all the rage here. too bad they're like $10 bucks in NY. Danny - apparently his brisket is even better. 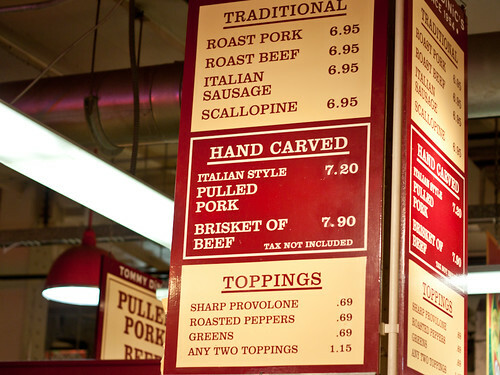 Tony Luke's one upped Dinic's on the roast pork though, quality and quantity. Does Tommy DiNic's ship sandwiches to California? The bread is important too. It is an integral part of the sandwich. It must absorb enough meat juices to give you the satisfying sop and drip, but not become soggy and fall apart. It must be chewy, but yield gracefully with each bite. And it must be light and fresh, yet compliment the starring flavors of meat, cheese and toppings. This bread is perfect.